German Baroque Wood Carver Famous for Altar at Uberlingen. By master carver Jorg Zurn. 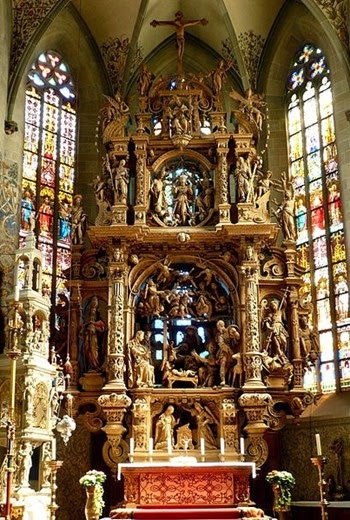 A specialist in wood carving during the era of German Baroque art, Jorg Zurn is best known for his masterpiece of Baroque sculpture - the 10-metre-high, five-storey High Altar of the Virgin Mary (1613-16), in the Church of Saint Nicholas at Uberlingen. A dynamic composition which borrows elements from Mannerism as well as early Baroque, it ranks alongside the finest works of German Gothic Sculpture by such masters as Michael Pacher (1435-98), renowned for the St Wolfgang Altarpiece (1471-81); Veit Stoss (1445-1533), best remembered for the High Altar of St Mary's Church, Krakow, Poland; and Tilman Riemenschneider (1460-1531), who carved the famous Holy Blood Altar, Rothenburg ob der Tauber. No other major scuptures by Jorg Zurn are known, although occasional items surface from time to time. In New York in 2002, for instance, an art exhibition held by American dealer Anthony Blumka and German dealer Julius Bohler from Munich, included a lifesize wooden carving by Jorg Zurn of the Archangel Michael, which was on sale for around $250,000. He was born in Uberlingen, a town on the northern shore of Lake Constance (Bodensee), the eldest son of sculptor Hans Zurn the Elder (1555-1632), who went on to father five more sons all of whom became sculptors. Jorg's brothers included: Hans the Younger (c.1585-1625), Martin (c.1587-1666), Michael Zurn (c.1590-1660), Hans Jakob (c.1592-1655) and David (c.1598-1666). Jorg was first apprenticed to his father before training at several different workshops in southern Bavaria. In 1604, at the age of 21, he joined the local Guild of Sculptors. The Zurn family were one of the most productive family of Baroque sculptors working in Southern Germany and Upper Austria, during the late 16th-century and first half of the 17th century. 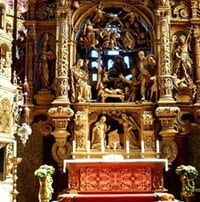 Specializing in religious art - mostly wood carving - for Catholic churches in the area, the family benefited from the campaign of Catholic Counter-Reformation Art, instigated by the Council of Trent (1545-63), which involved the building or renovation of numerous churches, minsters and cathedrals throughout Austria and Bavaria, many of which required carved altarpieces, statues, choir-stalls, confessionals and other woodwork. Even the most functional furnishings were generally decorated with relief sculpture and other types of carving, mostly executed in the flamboyant Baroque style. Given the demand for his family's services, Hans Zurn the Elder would no doubt have kept his eldest son busy from the moment he finished his training. In 1613, the Zurn family was commissioned to produce a High Altar for the Munster St. Nikolaus - the largest late Gothic building in the Bodensee region and a major landmark in Uberlingen. Primary responsibility for this work of altarpiece art was assigned to Jorg Zurn, although his father as well as younger brothers Martin and Michael - lent valuable assistance. Carved out of spruce and limewood, the St Nicholas High Altar was produced in the same vein as the great church altarpieces of northern Europe, although the work stands out from its predecessors thanks to decoration inspired by the Mannerism school. In the same way, the posture of the figures, and the layout of the different scenes illustrates the energy, diagonals and other visual dynamics that characterize the style of Baroque art then emerging throughout Europe in the early 17th century. Overall it remains a beautifully conceived work, rich in workmanship, and perfectly illustrates the penetration of 'modern' motifs of Biblical art in a region where codes of Gothic sculpture had endured for centuries. Now regarded as one of the greatest sculptures of the early Baroque, it has immortalized Jorg Zurn as one of the most creative German Baroque artists of his day, although the obscurity in which he spent most of his life suggests that contemporary opinion may have been rather different. More is known about the rest of his family. His father, Hans the Elder carved the high altar for the Church of Frauenberg in Waldsee (1624), and is noted for both an attractive Crucifix (Isnyer Tor Chapel, Wangen) and a bust of St Jacob (Germanisches Nationalmuseum Nuremberg). Jorg's brother Hans the Younger is documented in 1613 as a master sculptor in Buchhorn am Bodensee (now Friedrichshafen), and is noted for the lindenwood altar of the Virgin in St Martin, Wangen. Martin Zurn completed several works in the Lake Constance region, notably the altar of the Rosary Brotherhood in the Church of Pfullendorf (1615) and the later altar in the Church of Owingen. Between 1638 and 1639 he carved the pulpit for the Church of Wasserburg. Around 1640, Martin, Michael, Hans Jakob and David Zurn settled in Braunau am Inn, Upper Austria and went on to carve altars and other works of Christian art for many of the churches of the region, in particular the wonderful crucifix for the church in Eggelsberg and the high altar at Burgkirchen. The family affinity for sculpture was maintained by the sons and grandsons of David Zurn, who worked in Passau, Wasserburg am Inn, and Olomouc in Moravia into the early eighteenth century.  For more about German Baroque sculptors and wood carvers, see: Homepage.